1) Combine all of the ingredients (EXCEPT hazelnut oil and cornmeal). Use a bread machine's dough cycle to mix, knead, and raise the dough. Form a smooth, soft dough, adding the additional flour as needed. It should be almost too sticky to work with (a little dough will stick to your fingers but most will stay on the dough ball). Alternatively you could use your hands, or an electric mixer, to knead, placing dough in a greased bowl, cover, and let rise until doubled, about 1 hour. 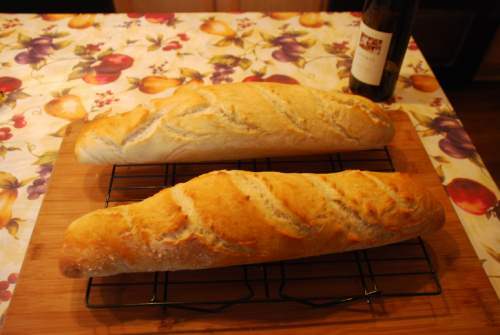 2) Divide the dough in half, shape, and put in the two baguette loaf pan, mine is perforated; or shape into two oval loaves and place on a lightly greased, cornmeal-sprinkled baking sheet. Cover, and let rise for an hour, until doubled. 3) Preheat oven to 450°F 30 minutes before baking. This is best done with a baking (pizza) stone so starting early allows it to heat up. Have a broiler pan on the lowest rack or floor of the oven. I have lava rocks in the broiler pan for a large surface area giving a flash of steam in the beginning. NOTE, IF HALF BAKING LOAFS: Bake to 180-190°F. Cool, do an airtight wrap, and freeze. To finish, completely thaw, several hours. Bake at original temperature for 10-15 minutes. 4) Slash the tops just before putting in oven. When you put loaves in the oven add ½ cup boiling water to broiler pan to add steam to oven and bake for 10 minutes. Brush tops with hazelnut oil and continue baking until golden brown, or interior bread temperature reaches 200°F, about 10 minutes. Remove from the oven, and cool on a rack. NOTE: For extra flavor try this: Combine the starter, the water, and 3 cups of the flour. Cover and let sit for 2 to 4 hours, until bubbly. Add the remaining ingredients, using only 1 teaspoon of yeast, and proceed with the recipe. Many recipes for sourdough breads include some active dry or instant yeast to speed up the process, as the sourdough starter is included mainly for flavor. We recommend beginning sourdough bakers start with this bread before moving on to the Classic Sourdough Bread that follows. This version makes a quicker loaf with a slightly different texture and taste, and is a good introduction to the sourdough process. It's sometimes a fact that sourdough breads don't brown well. To promote browning, brush the loaves with vegetable oil about 10 minutes before the end of the baking time. Based on King Arthur Flour recipe shipped with sour dough starter.